Thank you for your enquiry to the Royal Horticultural Society’s Members’ Advisory Service. Our Botanist Dawn Edwards says the additional photograph showing the leaves you sent for identification appears to be an Abelia – probably A. triflora, although I would expect this species to have five sepals and this is not clear in the image. 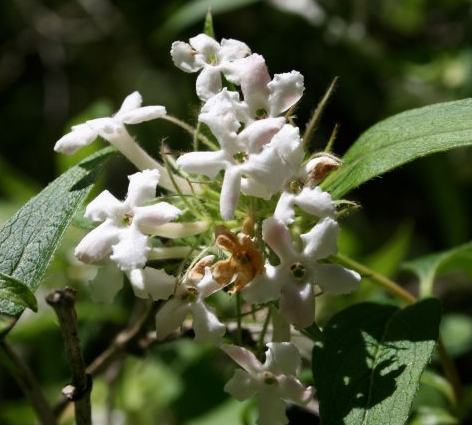 I haven’t managed to find a good image matching up the stems but a google image search for Abelia biflora shows images with similar stems to those shown in the first photographs. I am sorry for the confusion but plant identification from photographs is difficult unless we are supplied with good clear images of the whole plant as well as detailed images of the flowers, fruit and leaves as well as details of where the plant is growing and its size. When Edwina sent me this email, I googled images of Abelia triflora and, although I couldn’t find any pictures of the zig-zag joins to the bark, I discovered the stems are apparently used to make walking sticks, which would indicate that they were decorative. The images of A. triflora’s leaves that I’ve found are very accurate, matching the long, leathery leaves in our photo, and the wisps that remain when the flower-petals fall are just like those we’ve seen. In conclusion, our mystery is solved. Many thanks, Edwina. Posted on October 29, 2012, in News 2012 and tagged Abelia triflora, challenge, plants, RHS, royal horticultural society, tree. Bookmark the permalink. Leave a comment.